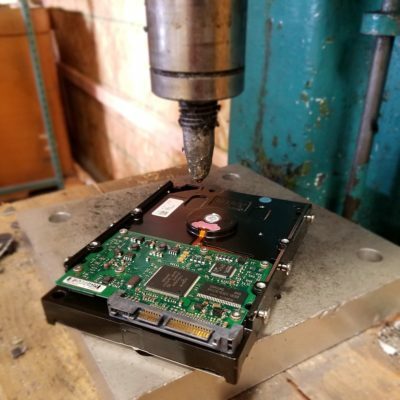 California Electronics Recycler offers hard drive data destruction to protect and secure your old data from ever becoming abused or breached. Our hard drive destruction process promises protection and security of your data. We guarantee your data is completely destroyed and irrecoverable… PERIOD! Many electronic recycling centers offer data destruction services but don’t assume they are all alike. Some recycling centers are not ethically recycling their electronics and will often sell their electronics overseas just to make a profit. At California Electronics Recycler we have destroyed over a million data devices and know the right techniques to handle and dispose of your confidential and sensitive information. The best form of security after decommissioning your IT assets is to have the data destroyed completely by a reputable Data Destruction company like California Electronics Recycler. Degaussing is the process of reducing or eliminating an unwanted magnetic field (or data) stored on a tape or disk media. When exposed to the powerful magnetic field of a degausser, the magnetic data on a tape or hard disk is neutralized, or erased. Hard Drives that are degaussed are no longer usable and will be recycled responsibly. Data destruction can require physical destruction of the hard drive. With the help of a hard drive shredder you can rest assure that these hard drives are impossible to be read and recovered. We have more than a decade of experience with hard drive data destruction and hold the highest standards for making sure that your data is destroyed permanently. At California Electronics Recycler we pride ourselves on our commitment to our clients when dealing with the destruction of their data while keeping the environment clean from electronic waste. What happens after the Hard Drives are Physically Destroyed? After hard drive data is completely destroyed through our degaussing machine, the hydraulic press and/or shredder, one of our R2 certified downstream vendors will dispose of the remaining raw materials. We only use R2 certified recyclers because of their high standards when it comes to eco-ethically recycling e-waste. It is sometimes possible to recover some of the cost of disposal of hard drives through the sale of the recyclable materials.